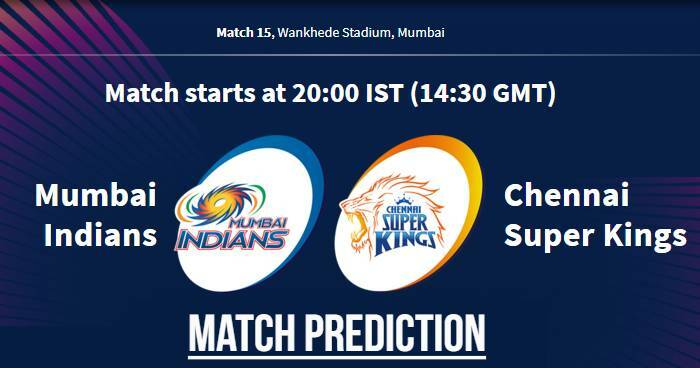 Home / Chennai Super Kings / CSK / IPL / IPL 12 / IPL 2019 / Match Prediction / MI / Mumbai / Mumbai Indians / Wankhede Stadium / VIVO IPL 2019 Match 15 MI vs CSK Match Prediction, Probable Playing XI: Who Will Win? VIVO IPL 2019 Match 15 MI vs CSK Match Prediction, Probable Playing XI: Who Will Win? Probable Playing XI for CSK: MS Dhoni (c & wk), Shane Watson, Ambati Rayudu, Suresh Raina, Kedar Jadhav, Dwayne Bravo, Ravindra Jadeja, Mohit Sharma, Deepak Chahar, Shardul Thakur, Imran Tahir. The team batting first will constantly recalibrate a par score to account for the dew allowance. But looking to the stats there is no major advantage of chasing here with teams batting first winning exactly 5 of the last 10 games. A 190+ total will be a good score to defend on this pitch but looking but it depends on the dew factor which will come into play later in the match. 200+ score can also be scored here in the first inning. In last match here in IPL 2019, Delhi Capitals posted 214. Our Prediction for IPL 2019 Match 15 MI vs CSK Who Will Win? A win for Mumbai Indians is depended on Rohit Sharma performance. Looking Rohit Sharma's averages in IPL is 45.53 in Mumbai Indian’s wins and 19.69 in their losses. In IPL 2019, Rohit Sharma scored 48 in the match won by Mumbai Indians while he averages 23 in the two matches Mumbai Indians lost. the form of Ambati Rayudu, and death bowling - to address, but their customary fast start to the season of three wins in three, keeps them relatively pressure-free heading into this contest.